2018 Teen Summer Jobs Finish Strong, Up 8 Percent From 2017 | Challenger, Gray & Christmas, Inc. Teen hiring in July rose 62 percent from the 190,000 jobs added in the same month last year, as 307,000 workers aged 16 to 19 found employment, according to analysis of non-seasonally adjusted data from the Bureau of Labor Statistics by global outplacement and executive coaching firm Challenger, Gray & Christmas, Inc. This summer saw 1,388,000 jobs gained by teens, 7.8 percent higher than the 1,288,000 jobs gained by teenagers last summer. It is the highest number of teen jobs gained since 2012, when 1,397,000 jobs were added. 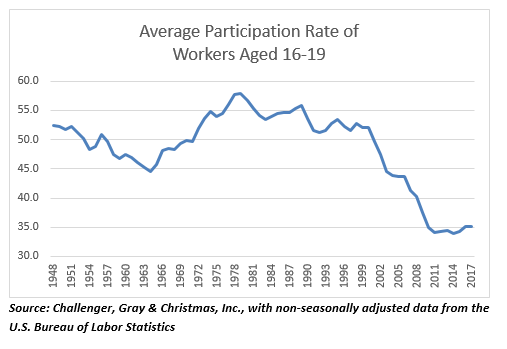 “Some retailers announced they were beginning to hire for the holiday season early, a boon to teen workers who want employment,” said Andrew Challenger, Vice President of Challenger, Gray & Christmas, Inc.
“While the participation rate among teenagers has averaged under 40 percent per year since the recession years, teens can certainly benefit from the tight labor market, especially as employers struggle to fill positions,” he added. The teen job market is far from the highs of the late 90s. After the dot-com bust at the turn of the century, teen employment fell below 2,000,000 jobs added and never recovered. In 2000, with a 52 percent participation rate, teen summer hiring dropped 25 percent from the previous year, from over 2,000,000 jobs added to just over 1,500,000. Last year, the teen participation rate averaged 35 percent for the year, with nearly 1,300,000 jobs added. “Teens are opting out of the job market, as other avenues for development, like volunteering, summer school, hobbies, or travel, take priority,” said Challenger.